Fire at Mangalore Government Hospital (India). Panic struck at the Government Wenlock Hospital for a brief period following a fire at the CT scan center on Friday. The fire was noticed just as the Medical Education Minister Sharan Prakash Patil and Health Minister U. T. Khader arrived at the hospital. Due to short circuit in the air-conditioner wiring, fire caught up in the CT scan room. The hospital’s safety officers swung into action and soon extinguished the fire. Thick smoke engulfed the CT scan room. A fire engine was also pressed into action. 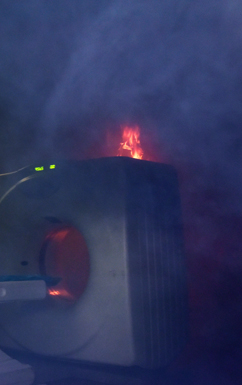 Luckily, the fire did not spread to the CT scanner or other equipment’s. Except for the AC which was burnt, no major damage or injuries were reported. A short circuit caused a fire at a maternity hospital, damaging its operation theatre in Anantnag district of South Kashmir, officials said today. The fire broke out in the operation theatre of main maternity hospital at Sherbagh in Anantnag town, 55 kms from here, around mid-night, an official of the Fire and emergency services reported. Fire tenders from the local station and nearby Sarbal headquarter were immediately pressed into service and the fire was brought under control within an hour. Timely action saved the two-storied main building of the hospital from destruction, the official said adding that some costly equipment inside the operation theater were either completely or partially damaged in the blaze. However, the official said there was no causality in the fire which was caused by short circuit. Officials said panic-stricken patients and their attendants shifted to safer places immediately after noticing the fire in the building.